Some sales are so good that we feel like there must be a catch. Like, are the shoes going to come in a box that only opens if we stick an extra 100-dollar bill in the lock? Is there fine print hidden somewhere telling us that by clicking “Complete Order,” we’re agreeing to sell our souls? We can promise that although this sale seems way too good to be true, it’s legit. No fine print, just us looking fine in our new booties. 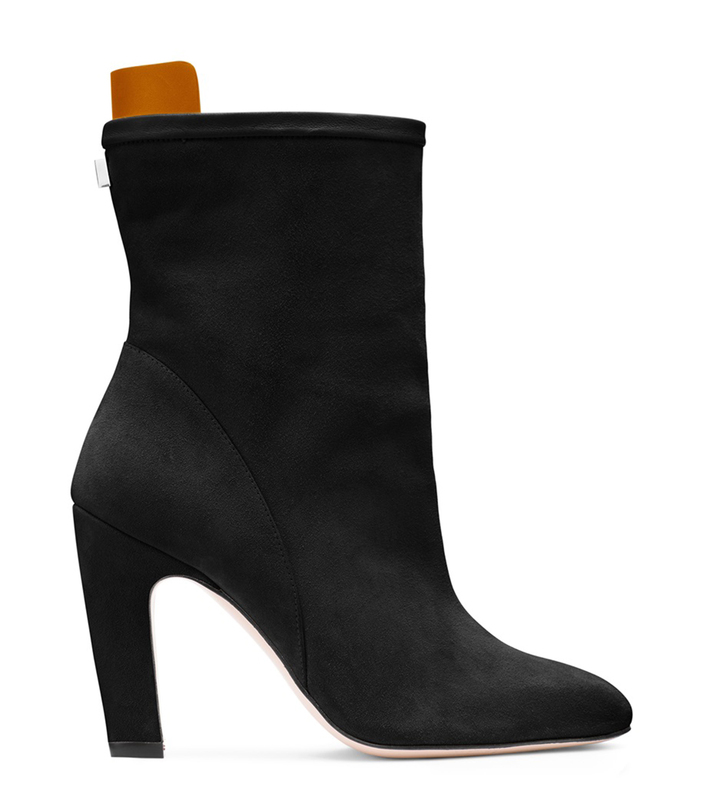 Stuart Weitzman’s Brooks Bootie is no average bootie. Its “sculptural sensibility” is unmatched by other booties. They’re even more amazing because Duchess Meghan rocked these on a recent trip with Prince Harry! See it: Get the Brooks Bootie (originally $598) for 67% off at Stuart Weitzman – While supplies last! Shoppers are loving how “amazingly comfortable” they are. One commented on their “perfect blend” of comfort and style, making them a great fit to wear to work, to a date or to an outing with friends. These booties are even fit for royalty! Duchess Meghan chose to wear these exact booties on February 25 during a trip to Morocco! She was strutting in style at the Moroccan Royal Federation of Equestrian Sports in Rabat, Morocco even though she was walking through some rough terrain! These boots were made for walking, alright! These boots are leather all over (and inside) with a smooth, suede upper. One thing that’s unique about this bootie is the ability to wear it either slouchy, letting it hit just above the ankle, or pulled straight for a clean, streamlined fit that hits mid-calf. We love how Stuart Weitzman experiments with adjustable shoe heights, as also seen on the brand’s ever-popular Griffin rain boots. Another unique aspect of these Brooks boots is the heel, which stands just barely under 4 inches. It’s a sturdy block heel, but it’s thin enough to give off a stiletto vibe. This heel is also subtly angled, adding a real-life twist to the shoe! How interesting is that? This lets our vision capture the contrast of the light beige heel against the suede. Yet another unique feature we can’t get enough of is the exaggerated leather pull tab that sits atop the back shaft. Usually boots just feature an insignificant loop, which is just there because it has to be. It’s like when we show up to a party we have no interest in attending, but if we don’t go, there’s going to be a problem. This pull tab, however, shows up to the party with something to prove, and that something is that it’s fabulous and not shy about being so. See it: Get the Brooks Bootie (originally $598) for 67% off at Stuart Weitzman! Just below the leather pull tab is Stuart Weitzman’s signature metal square stud in silver. This metallic glimmer is small, but makes a big difference in the overall look of the boot. That extra twinkle is great for matching with our jewelry and for catching eyes. The Brooks Bootie is currently available in three colors, all of which are included in the amazing sale! Beige has a strong light pink undertone, making this shade a great choice for spring or even summer. The leather pull tab matches the upper perfectly here. This neutral color can be paired with mostly anything. We think these booties would look especially stunning with navy, green or even white. Wine is a deep, deep red we’re ready to sink into. The pull tab also matches the upper for this shape option. We would love to wear these with a black dress, dark-wash denim or perhaps pastels to pull it all together. Black is also available for a boot we can truly wear every day. What’s different about this shade is the leather pull tab, which is a caramel brown. We love the way it confidently sticks out to say hi! Also how useful it is when sliding our shoes off at the end of the day. When we buy our own pair of Brooks Booties, we can be sure they’ll fit us perfectly by not only choosing our size, but our width, too! We can choose between medium and wide for a shoe that’s crafted specifically for our feet. If we’re between shoe sizes, it’s recommended that go down half a size for the best fit! After reading all of that, isn’t it hard to believe that these booties are almost 70% off? We live in a wild, wild world, and we’re loving it. Time to stomp all over it in our new shoes like a model rocking the runway! See it: Get the Brooks Bootie (originally $598) for 67% off at Stuart Weitzman! Not your style? Check out other sale booties from Stuart Weitzman here and a whole variety of sale styles here!